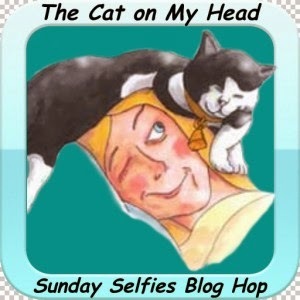 Isadora, " I am joining our sweet furiends at , The cat on my head , for their fun Sunday Selfies! Here is my profile selfie. It's a bit boring so I tried again!" Isadora, " I shut my eyes tight in this second selfie! I am always anticipating a flash even if a flash is not necessary or forthcoming!" Isadora, " I believe this is my best shot! Can you spot the piece of grass at your right , stuck to the corner of my mouth? I was grazing on grass. I love grazing on grass! Do you?!" Levon, " I have had a rather productive week if I do say so myself!" Levon, " Would you care to know what I have been up to?" Levon, "My usual sun spotting , sun soaking and sun servicing. To service: perform routine maintenance or repair work. You see, I service the sun regularly. I most certainly do! I'm the sun repairman! I am!" Levon, " Which is why it has been performing evenly and serenely in our neck of the woods this winter. Come on over and join me! I'm basking in a wonderfully delicious sun soak as we speak! There's plenty of room for you and a friend or two or three. And I promise to serve liquid refreshments to all who would care for one as we while away the day! " See you Sunday for Sunday Selfies. Esme , " Pssst. Up here! On top of the fridge! That is correct. You have glimpsed my royal ear!" Esme, " It's me! Esmeralda Djali Willow Tree Figgy Pudding. That is my complete name as was given to me by LP. 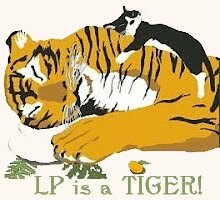 LP usually calls me by all sorts of "pet names" though on account my full name is a bit of a mouthful. 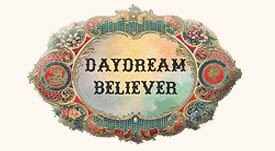 Kind of like having a spoonful of marbles in your mouth then trying to gargle and speak in tongues all at the same time or something like that... Do you have pet names? You know, fun sweet nicknames?" Esme, " One of my pet names is, Princess Puddy Pop. That's long too but certainly more manageable. Did you notice that the bed I am lying in, the one which lives on top of the fridge , has a blanket in it with a pattern of crowns?! " Esme, " This blanket was bought for Levon. One of his pet names is, The Little Prince. Hence the crowns." Esme , " As if he could be a little prince! Too laughable! There can only be one royal subject in this household and that would have to be ME! Princess Puddy Pop. Note the tiaras on MY royal blanket?! Levon can be the Little Clown!" Esme, " That's all folks! I rest my case." the critters in the cottage xo. P. S. Lynn, in answer to your question yesterday, Malou is a devon rex cat as are Esme and Levon. Mitalee, is a selkirk rex cat. 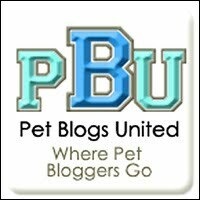 Wordless Wednesday: Sugar and Spice and Everything Nice. Malou! A Special Gift From Nature. 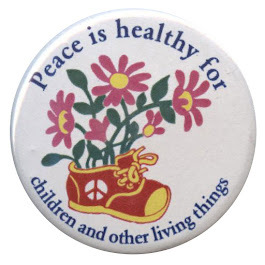 Isadora," We went to one of our favourite parks for a walk and nature gave us a special gift. The snowgeese , who spend their winters in Vancouver before returning to nest on the Arctic tundra each Spring, were landing as we entered the park. LP took photos of them as they landed all around her. She was right in the middle of them and said it was thrilling! Duffy and I watched from the sidelines but we found it equally exhilarating!" Isadora, " There were thousands of snowgeese all around us!" Duffy , " It was mystical! Otherwordly! Magical!" Duffy, "We will always remember the day the snowgeese descended upon us." Esme, " I am stretching my toes in the sun!" Esme, " We have been having lots of sun this winter. And the weather has been extremely mild compared to all the winter storms so many others are experiencing in Canada." Esme, " This plant is already blooming in our garden. It is an early bloomer but should be blooming in April not February!" Esme, " I won't complain about the sun but LP says a lot of her plants in her garden have died this year because it has been cold, then rainy, then hot and sunny, then cold and sunny, then rainy and mild again, which confuse the plants' cycles." Esme, " Luckily I am a plant that thrives under any weather conditions as long as there is sun!" Esme, " Old Man Winter, I love that you have caste your sights elsewhere this year!" Malou, " I volunteered to join our sweet furiends at The Cat on my Head today for their funtastic Sunday Selfies! 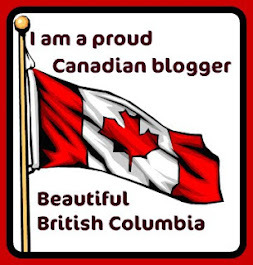 Mostly because I haven't been on the blog lately and thought some of you might have missed me!" Malou , " Here is my nose." 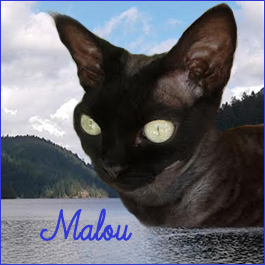 Malou, " Maybe I should stick to a profile selfie. That makes three selfies of me! Hope that makes you smile with glee! :) "
Don't forget to HOP! It's a great way to meet new friends. 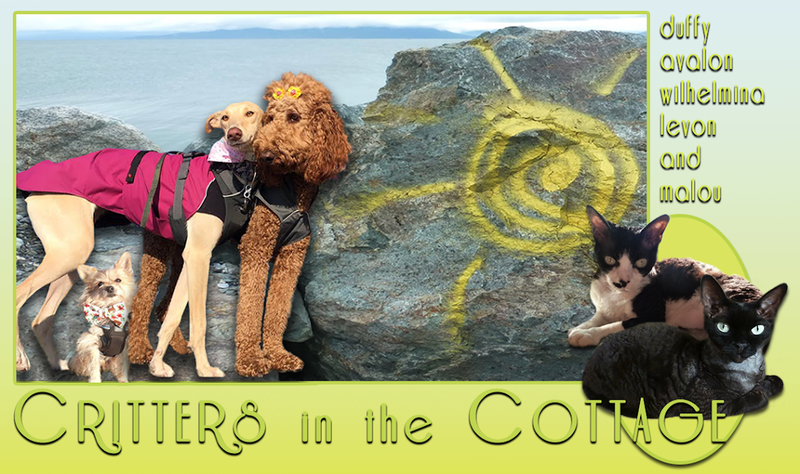 We are two cats and three dogs living happily together in Vancouver, Canada. 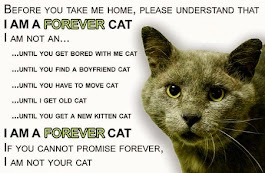 THIS IS TRUE FOR ALL POTENTIAL PETS! 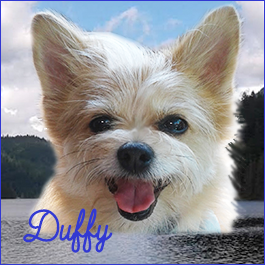 Duffy came into our lives after a friend who owned him , died unexpectedly in 2009 . He is extremely sociable and a huge , giddy , handful ! Duffy must say hello to every living being he encounters . He loves a stuffie named Yummy Monkey . Yummy and Duffy can always be found together at bedtime. Malou is a little bit of spice mixed with a whole lot of nice. I call her my Salty Licorice Baby.Salty is our squeaky wheel who lets us know the going ons of the cottage. 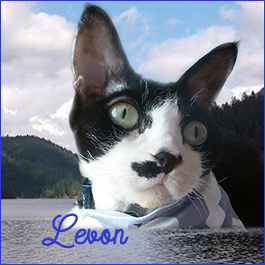 Levon is our Sugar Dumpling. He loves to be cuddled like a baby but don't let him fool you. He is otherwise constantly on the go and the ring leader to almost all the trouble in the cottage! 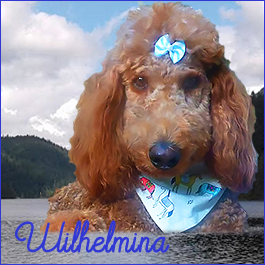 Wilhelmina is the cottage clown. She is a free spirit who is intelliegent, funny and loyal to those she loves. We call her Pony Girl. She is the apple of our eyes! 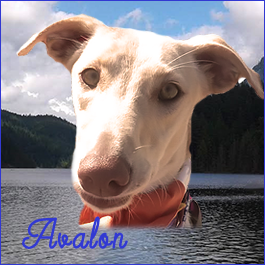 Avalon is a rescued Galgo (Galga) from Spain. She is the newest member of our family. She has fit into our family seamlessly. She is bold and spontaneous and the Leader of all that is Fun! We are , each and every one of us, in love with her! Please click here to visit our angels. According to the Chinese Zodiac . Light for people and animals in need throughout the world.